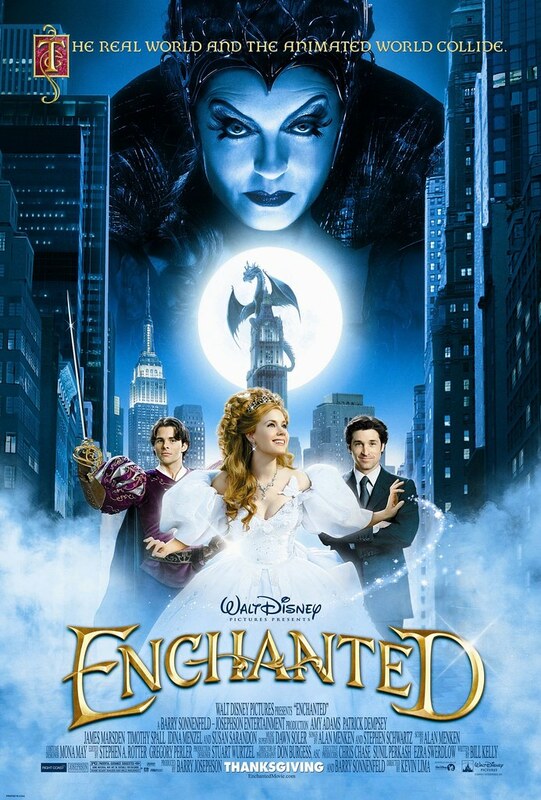 I know I kind of super late of watching Enchanted since this film is released like ten years ago. But, better late than never, right? Or so they say anyway. And when I heard that the sequel Enchanted is going to be made, that’s when I decided I really need to watch this film. It seems like everyone loves this film. To be honest, I am not a fan of Amy Adams. However, I know she’s a great actress. Five times nominated for Oscars is a big deal, even though she hasn’t won one, but being nominated for five times is already great enough. In Enchanted, Amy Adams proved that she indeed can play any character, even the most fairytale-like character. The voice that she made when she talked is just perfect for a fairy tale character. Her singing voice is also beautiful too. Amy Adams has truly made the character of Princess Giselle entertaining and loveable. I have seen Patrick Dempsey in Grey’s Anatomy and surely he is very handsome and very attractive indeed. His acting in Enchanted is pretty much very entertaining as well. Patrick Dempsey played the role of Richard, a divorce lawyer, who accidentally met Giselle on his way home with his daughter, Morgan. The interaction between Giselle and Robert is a combination of funny, entertaining, and sweet enough. I smile a lot when I watched them together. Their story is very entertaining, funny, and interesting to watch. Patrick Dempsey’s mimic expression as Robert was perfect. I think everyone’s expressions in this film is great. Their expressions and mimics synchronised with the character they played. As for James Marsden, I know him from X-Men as the charming Scott Summers. In this film, he indeed played the character of Prince Charming, or to be exact, Prince Edward. I am very surprised that he has a good voice. I never heard him singing before and I am surprised to hear him singing. I am not a technical singer. I don’t sing and that’s why I don’t if his pitch is perfect or not. However, in my amateur opinion, his voice is already good enough. Despite liking Amy Adams, Patrick Dempsey, and James Marsden, I am not quite sure with Idina Menzel. I’ve watched Frozen (2013) where she played the voice of Elsa and I am truly like Elsa. However, I think there’s something off about Idina Menzel in this film. Her facial expression is lacking something that I can’t put a finger on it. It’s not that bad, but compared to the other characters, Idina Menzel is still lacking something. I don’t know if it’s just me or everyone did think so. Nevertheless, it’s no doubt that she has a really great voice, even though her singing scenes wasn’t as much as Amy Adam’s. As for the story itself, I think Enchanted is pretty unique. It combined the real and fairy tale world. Animation and reality. Enchanted also is the combination of many fairy tales story put together, though not as extreme as the TV series of Once Upon a Time. The combined between Snow White and Cinderella in Enchanted is put perfectly balanced and not exaggerating. It did make a new kind of story between some old fairy tales seasoning. Like any other fairy tales, it’s not hard to see which Prince would Giselle end up with—though Robert is technically not a prince. I also love the dancing scene during the ball. I guess I have a thing with anything about waltz. Even when I watched The Young Victoria (2009) and Crimson Peak (2015), the dancing scenes are my favourite scenes. Amy Adams and Patrick Dempsey are perfect together in this film. Overall, Enchanted is a good film. It’s unlike any other Disney princess films. It’s unique, interesting, and funny. I really enjoy the film very much despite being so late for me to finally watch it. I give Enchanted 8 out of 10 stars.